http://stateandstandard.com/2017/01/mens-grooming-products/ http://ibyang.com/2007/07/princess-hoursgoong/ This is an online fiddle lesson for the tune "Sail Away, Ladies." 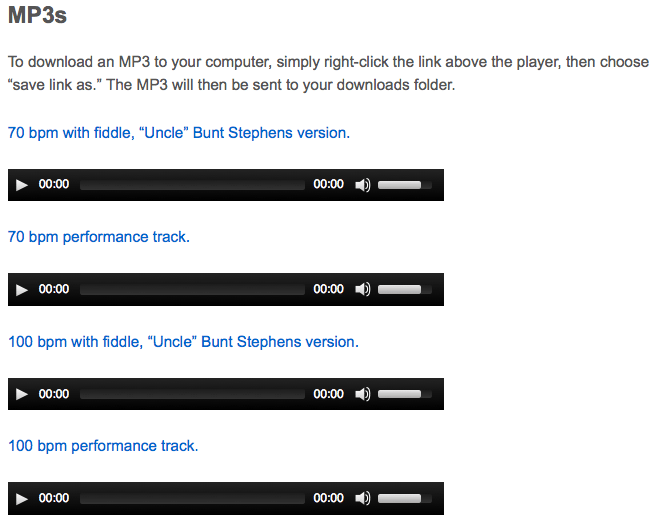 This post contains two lessons: First, the old-time version, as played by "Uncle" Bunt Stephens (1926), Then, a beginner version for those just getting started. Sail Away Ladies: Old‑Time, Breakdown. USA; Kentucky, Tennessee. G Major. Standard tuning. The tune is related to the numerous versions of "Sally Ann" played in the keys of A and G Major. According to Guthrie Meade (1980), the tune is identified with the south central Kentucky and middle Tennessee locals. Harry Smith (Folkways FA2951, 1952) thought that Uncle Bunt Stephen’s performance (Columbia Records, 1926) was “probably similar to much American dance music in the period between the Revolutionary and Civil Wars.” The title also appears in a list of the standard tunes in the square dance fiddler's repertoire, according to A.B. Moore in his 1934 book History of Alabama. Southern Kentucky fiddler Henry L. Bandy recorded the tune for Gennett in 1928, though it was un-issued, however, the earliest recordings were Uncle Bunt Stevens (1926-without words) and Uncle Dave Macon (1927-with words). Stephens was among the finalists of auto magnate Henry Ford’s series of fiddle contests, held at dealerships through the East and Midwest. He placed by playing this tune, along with his version of “Old Hen Cackled.” The top three winners of the regional contest were brought to Detroit to meet Henry Ford. (I'll) give my old one to my son. Children, don't you grieve and cry. You'll be angels, bye and bye. Come along, girls, and go with me. We'll go back to Tennessee. (I) got the news from Charlotte Town. Big St. Louis is a‑burning down. I chew my tobacco and I spit my juice. I love my Donna but it ain't no use. Uncle Dave Macon also included a chorus which went, "Don't she rock, Die-Dee-Oh?" but Paley notes that other old recordings have variants like "Don't she rock, Darneo?" and even "Don't she rock 'em, Daddy-O?" (which seems to harken to the beatnik era). English musician Dave Arthur remarks that the song became popular in Britain in the skiffle craze of the 1950’s, and appeared on vinyl EP Loneei Donegan Hit Parade vol. 2 (1957), under the title “Don’t You Rock Me, Daddy-O.” A few years later it appeared on the set-list of the band The Quarrymen, out of Liverpool, who metamorphosed into the Beatles. This topic contains 18 replies, has 7 voices, and was last updated by John Cockman 3 years ago. I think that Mr. Cockman is the best fiddle teacher in the world! John I’m having trouble getting the rhythm for the intermediate version of sail away ladies. I feel like I’m just missing a beat here and there. I’m having trouble with the first and third measures. What I’m trying to do is vocalize the grove when you play then play it back. It’s like I’m miss firing on the grove. Any suggestions on breaking down the opening measure. I’ll try to post a video, but I’m not competent on my modern technology. Hi Joseph, thanks for contributing! 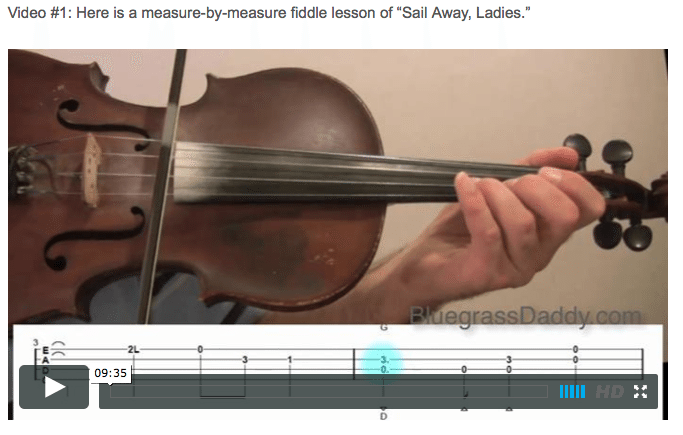 “Sail Away Ladies” does something that a lot of old-time tunes do, which is to start the first note of each measure one beat early. This is called “jumping the measure,” as in “jumping the gun” in a foot race. If you look at the tablature, the pickup note is actually the first note of the first measure, just “jumping” in one beat early. Similarly, the last note of the second measure is actually the first note of the third measure, just “jumping” in one beat early. It is a little difficult to get the hang of, but you see it a LOT in old-time music. 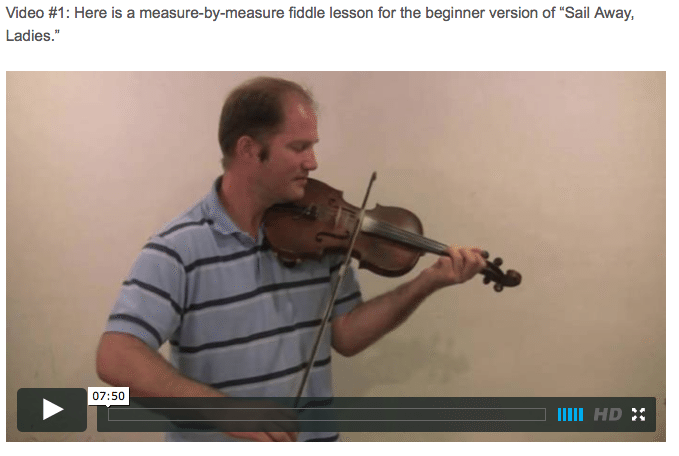 On thing that would help is for me to create a metronome video for this lesson. I will try to do that this week so that you can follow along with me! Excellent John ! I fink I m going for this one next ! Love the feel, so groovy , shoulder swinging canoe trip down the river again. Did I love, I LOVE these kind of tunes. Your going to make a fiddler out of me yet ! Thanks Gu, but you are ALREADY a great fiddler! This is a good one to learn. So many old-time songs sound just like this one! Thanks John, your way to kind, both you and Scott said great, and my head almost exploded, so , I say this blushing, my standards of great is YOU , John , and that’s why I chose you to be my teacher,and thank Goodness you made this real, so, I know I am under great , witch makes it a , good or very good, or even good enough to move on to great ! :O) Awe shulks , also , I would say great is when your repertoire is like your 100 lessons here or so, played with your smoothness charm but I know thanks to the ” Captain” I sort of have an ok charm, but I would then have to say your greatness also has awesomeness to it, so even if I do achieve greatness charm I would still have to push on for the awesomeness and smoothness, or maybe I will need a better Bow ,wink, wink..and I really only have maybe 13 songs in my pocket. Got 8 more songs I should be posting here yet in the Lions Den soon. I am probably going to keep typing here cause I am still blushing. Enough said, time to put Farewell Trion in the Roahrr section. I am like Kevin , I really want to make this experience blow me into a new level of music. I’ve been watching the free lesson on you tube. I’m a fairly experienced Irish dance band fiddler. I’m playing for a wedding dance in a couple weeks, and was informed I would have to play some old time tunes in addition to Irish. I have many in my head from a prior life playing rhythm guitar and some clawhammer banjo for contra danceing. 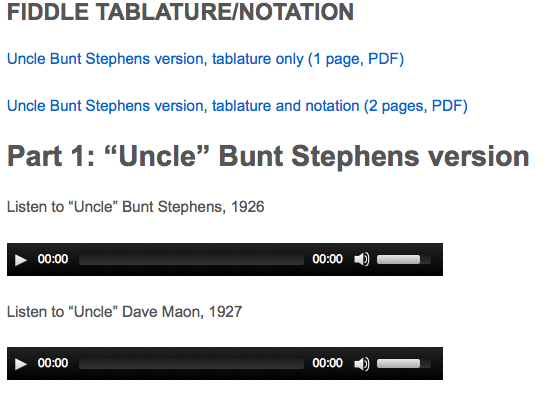 So, I really like the old time feel of you Uncle Bunt Stephens version. But I do have a request. I just joined for a month to keep working on Sail Away Ladies, and you have several others I need to play for the wedding dance. My request–you spend a lot of time on the bowing pattern for the second measure of each measure. You also indicate the bowing, down, then slur up two notes and finish on a down bow for the note to follow into the next measure/line. But you never indicate the bowing directions/slurs for the first measures. One time, measure 9 I believe, you do articulate or verbalize your bowing. But the rest of the time, we’re on our own. I went to youtube and slowed it down to half speed, and if I’m not mistaken, in two measures, you play the first measure differently the second time (let’s do it again, or something like that). Not a big deal, as I’ll do one or the other, but if you indicate the bowing in the tab for all measures, I think you’d be more consistent. All in all, I think I’ll enjoy this month, and since I’m moving to Texas in Dec. for the winter (from Minnesota) I’ll be playing more for contra dancers down there and will find your lessons very hepful for that. Thanks for the great teaching. Wow, I’m impressed. You replied to my introduction post early this morning. Now, I’ve got a tab with bowing directions and everything I asked for. Thanks a bunch. I’m really enjoying this tune, and the challenge of playing it your way (like Stephens) and not the way I’d do it if it was an Irish dance tune. I’ve also started on Whiskey Before Breakfast as that’s on my wedding dance list for Oct. 10. Nice lesson there. You are welcome! I do play Forked Deer. I’ll try to get the tabs for that one up soon. It is a cool tune! SALLY ANN . AKA and see “Beano,” “Darneo,” “Dineo.” Old#8209;Time, Breakdown. USA; West Virginia, Virginia, North Carolina. D Major. Standard tuning. AABB. One version of the tune was recorded for the Library of Congress by musicologist/folklorist Vance Randolph from Ozark Mountain fiddlers in the early 1940’s. 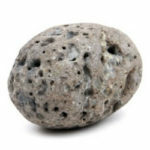 See also related tunes “Big Sweet Taters in Sandy Land,” “Great Big Tater(s) in Sandy Land/Lot,” “Sandy Land,” “Sail Away Ladies” (Kentucky/Tennessee), “Wish(ed) I Had My Time Again” (Ky.). One version of the tune goes by the name “Dineo” in the Franklin/Floyd County area of southwestern Virginia, and it was recorded as “Darneo” by the Blue Ridge Highballers (Yazoo CD 2046). “Sally Ann” has been jokingly called the Surry County, North Carolina “national anthem.” Among the many early recordings of the tune was a version by the Ashe County, North Carolina, string band Frank Blevins and His Tar Hell Rattlers, a name made up on the spot at the 1927 Columbia recording session in Atlanta for 16 year old fiddler Frank Blevins, his older brother and guitarist Ed Blevins and banjo player Fred Miller. The band’s playing was inspired by a few shots of corn liquor from a convenient jug. The Hill Billies, a Galax, Va., area band, recorded an influential version in 1925 (re-released on Document DOCD-8039). Fiddler Joe Birchfield (1911-2001) of Roan Mountain, Tennessee, played a version of “Sally Ann” in the key of C.
It is confusing. There are just a lot of tunes out there with the same name. They are said to be in the same “family” of tunes. That particular tune family is called the Sally Ann family of tunes. It’s like a lot of the tunes from the children’s play-party tradition have the same lyrics. Haha kind of like Salt Creek and Red Haired Boy. Those definitely need to be in different set lists! I was trying to choose between Forked Deer and Sail Away, and I ended up going 5 min 11 seconds on John s Youtube Forked deer video about 8 times or so, after 45 min, got the a part down 🙂 Thanks John, even back then , you were the best :O) So, sailling ladies and Sally this made me think of sally Johnson ! Aw man, Gu, I can’t wait to hear you playing Forked Deer! One of my favorites. My brother taught it to me a few years back, at the Mountain Folk and Dance Festival in Asheville, NC.